No matter where she goes, freelance fabric restorer Zoe Templeman can’t escape the specter of violent death. When she checks in to pick up a pricey tapestry she’d just repaired for London antiques dealer Max Loudon-Fryer and was about to deliver to the purchaser in Paris, she finds Max hanging from a ceiling beam. It falls to Zoe not only to deal with DI Kennedy, whose suspicion of a suicide without a note intensifies when the coppers find a bloodstained hammer in the boot of Max’s car, but to brush safely into the background Saba Raz: the housekeeper/houri who found Max’s body along with Zoe but can’t afford to come into the spotlight herself. When Zoe repairs in weary chagrin to Stonecrest, the Kent estate her live-in lover, cosmetic surgeon Haydon Masure, has just bought, there’s no relief: Somebody tosses a petrol bomb into the cottage of Bert Styles, the watchdog who came with the place, and kills him. What do the two fatalities have in common, Zoe wonders nervously, besides her? 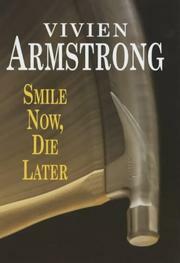 Although Armstrong takes so long to pull the strands of her web together that a jog-trot rhythm takes the place of suspense, there’ll be time for two more murders before a posthumous letter clears up the mystery. The neat windup requires a suspension of disbelief that’s not only willing but downright passionate, and never explains the long coincidences that have made Zoe an unlucky lady indeed. A notch below Armstrong’s best (Beyond the Pale, 2001, etc. ).